During the 2018 EFAC commencement in October, three graduates were honored with leadership awards that have been generously endowed by EFAC board member George Trumbull. Each award came with a stipend to be evenly divided between the recipient and the EFAC Student Association alumni organization. 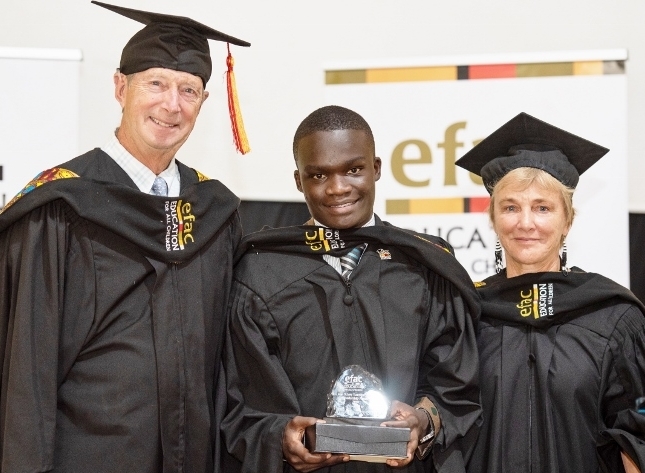 Collins Owino Odero received the Founders’ Transformational Leadership Award, recognizing an EFAC scholar who demonstrates leadership and resilience while serving as a role model for young people. The award is given in honor of Nancy and Rod Van Sciver, whose vision, courage and leadership founded EFAC and transformed it into today's successful organization. Collins’ personal transformation dates back to Rongai Boys’ School, where his teachers and peers knew him to be somewhat mischievous. Since those early days, he has transformed into a young leader who regularly demonstrates the entrepreneurial, mentorship and teamwork skills he has learned through our program, proving that barriers such as poverty can be overcome to achieve success. Known for his sartorial flair and poise when speaking in public, Collins is active in our student mentoring program and serves as president of the EFAC Scholars Association, which is comprised of more than 170 of our students and recent graduates. The oldest of six children, Collins is the first in his family to further his education. His personal transformation over the past eight years has inspired his younger siblings to seriously pursue their educations and they dream of following in their brother’s footsteps. Collins graduated from Multimedia University this year with a B.Sc. in Information Technology, and recently was offered a position with Intercontinental Hotel Group in Nairobi after receiving accolades for his performance during an internship. He was sponsored by Donna Lynn Tamaroff. While at Starehe Girls’ School, Sharon was an active volunteer and served in several leadership positions, including senior prefect-in-charge and representative on the school’s strategic planning committee. Her commitment to community service expanded during Sharon’s university years. Along with a team of other EFAC scholars, she ran a one-week campaign against FGM in Narok County that educated the community about the negative effects of this practice. Sharon actively participates in fundraising activities for Starehe Girls’ School; volunteers as a financial literacy trainer in high schools in conjunction with Standard Chartered Bank; and is an active member of EFAC’s mentoring team, visiting our partner primary schools to work with students in classes 7 and 8. Sharon earned a Bachelor of Economics and Finance at Kenyatta University, and recently began an internship at Ashoka, a global organization that identifies and invests in leading social entrepreneurs. An entrepreneur herself, Sharon designs African attire and accessories, using social media to market and sell her products. She has been sponsored by the Redpath family. Naom Nyachuba Anyona received the Prof. Leah Marangu Woman of Character Award. Named in honor of retired ANU Vice Chancellor and EFAC co-founder, the award recognizes a female scholar who embodies integrity, service and giving in every aspect of her life. “This award made me realize that I have had an impact,” says Naom. “To me, it means I should work even harder to make my impact felt further in the community. I have received much already from so many others, and I need to give back.” Her EFAC sponsor is Lindsay Frucci. Naom’s poised, outgoing personality and commitment to helping others serves her well in many capacities. As the first welfare officer of the EFAC Scholars Association, she convinced 35 of the organization’s members to contribute to the welfare fund (designed to help fellow members in times of need). Naom is also is role model to girls and young women in her community. She has used her entrepreneurial and mentorship skills to train other EFAC scholars in online work that helps them supplement their living expenses. Throughout her eight years in EFAC, Naom has demonstrated academic excellence, beginning at Starehe Girls’ School and continuing through university. In December she’ll receive a B.Sc. in Economics and Statistics, with academic honors, from Kenyatta University. During university, Naom began doing online work to supplement her living stipend. Taking advantage of her training in statistics and experience with several analytical software programs, she eventually formed her own business conducting field research projects and analyzing data. Naom is growing her business by providing additional services to clients, such as trainings, IT products and services, and office supplies.“Studying economics has shaped my thinking when it comes to the contemporary business world; from management to problem-solving,” she says. EFAC kicked off 2018 by welcoming 89 new Form 1 scholars to our program - our largest class to date! Each of these students began classes in one of EFAC's 13 partner high schools this month. Sponsorship is the cornerstone of our program. As many of you know, getting an education will completely transform an EFAC scholar's life. But what we've learned from EFAC sponsors is that their commitment to a scholar is also transforming THEIR lives. Two of our sponsors, Kate Starrett and Ryan Crowder, recently shared their perspectives on their trip to Kenya, and what it means for their families to support an EFAC scholar. Kate Starrett of Colorado brought her 6-year old son, Thatcher, to Kenya with EFAC last fall. They spent time with Linda Lydiah, the scholar they've sponsored for 8 years, and got to know many other students as well. Thatcher loved meeting Kenyan children during a visit to an EFAC primary school partner in the Kibera slum. "Because of EFAC and the opportunity to experience a different culture," Kate told us, "Thatcher asked me if he could give up his 7th birthday party and instead use the money to help Kenyan children stay in school." Being an EFAC sponsor is worth some small sacrifices for Kate and her family: "It sets a great example for our kids and shows that you can always find a way to give back to those with less." Ryan Crowder, a father of two young boys who lives in New Hampshire, says his reasons for supporting EFAC were "totally transformed" during his time in Kenya. Meeting the EFAC scholars face-to-face and hearing their stories was life-changing for Ryan. "Despite all the adversity in their lives, these kids have persevered. I could see and feel the deep gratitude they have for their EFAC sponsors and the opportunities they've received to change their futures." The trip to Kenya put a lot of things into perspective for Ryan. "Being an EFAC sponsor has become more about building a relationship with a student and fostering success in both school and life. It has humbled me. They don't realize it, but the EFAC students are teaching me to be a better person - and for that I am forever grateful." During the 2017 EFAC commencement exercises, three graduates were honored with leadership awards that have been generously endowed by EFAC board member George Trumbull. Each award came with a stipend to be evenly divided between the recipient and the EFAC Student Association alumni organization. Samwel Mwiko was awarded the Lynda Trumbull Community Service Award, named in honor of George Trumbull's late wife. The award recognizes a graduate who has demonstrated an extraordinary commitment to community service, one of the key tenets of our EFAC program. Lynda Trumbull strongly believed that each person has an obligation to support the broader community. 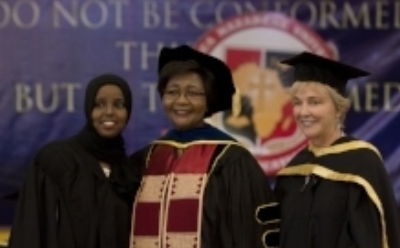 Sadia Abdulahi Salo was awarded the Prof. Leah Marangu Woman of Character Award. Named in honor of the retiring ANU Vice Chancellor and EFAC co-founder, the award recognizes a female scholar who embodies integrity, service and giving in every aspect of her life. 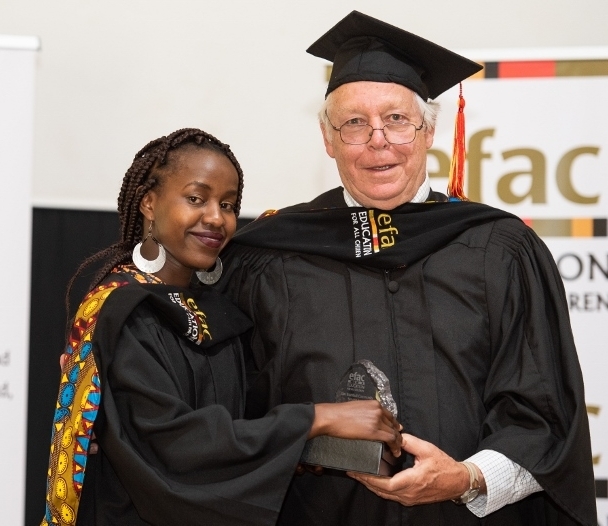 Esther Wagaki Mbugua was awarded the Founders' Transformational Leadership Award, recognizing an EFAC scholar who demonstrates leadership and resilience while serving as a role model for young people. The award is given in honor of Nancy and Rod Van Sciver, whose vision, courage and leadership founded EFAC and transformed it into today's successful organization. Yale University’s Young Global Scholars program has offered two full scholarships to EFAC scholars Stacy Murugi ’17 and Fridah Senteyion ’18, both students at Vanessa Grant Girls’ School (VGGS), for their two-week summer program in New Haven, CT. The mission of the Yale Young Global Scholars program is to empower the next generation of leaders by building a global community and offering interdisciplinary programs that foster intellectual curiosity, deepen understanding and inspire creative action across all borders. Stacy is a mentor at VGGS, a member of the drama club, and has participated in national languages and sciences contests. She ranks 1st in her Form 4 class and 2nd overall. Stacy lives with her mother, stepfather and younger siblings in Mbagathi, a suburb of Nairobi. Her mother had to give up her produce stand due to health problems, and Stacy’s stepfather does not have steady work. She has two younger siblings, one of whom is also an EFAC scholar at VGGS. Determined to realize her dream of a medical career, Stacy has always been a dedicated and hard-working student. Fridah is a class representative, the games captain, and plays volleyball at VGGS. She works hard in school, placing in the top third of her class and excelling in history. She was also a top fundraiser for EFAC’s Power of One walk. Fridah’s parents are subsistence farmers with a large family to support. Her father did not encourage her education, instead planning to have her marry early in exchange for property. Her mother sent Fridah to live with her grandmother, where she helped care for goats and was able to attend primary school. Despite these challenges, Fridah thrived in school, placing first in her class and winning a national essay competition, sponsored by Wildlife Clubs of Kenya, on caring for the environment. Stacy and Fridah will enjoy a few extra weeks in the US, visiting several EFAC sponsors and board members before and after the Yale program. Their trip will be an adventure for both girls, including their first time on an airplane, an opportunity to meet fellow students from around the world, and the chance to experience American culture. Education for All Children (EFAC) is pleased to announce the appointment of Blair L. Demers of Portsmouth as its new Executive Director. She joins the organization’s co-founders, Nancy and Rod Van Sciver of Rye, and Kenya Country Director Mary Kiguru of Nairobi, at the helm of Education for All Children. Founded in 2008, Education for All Children provides a comprehensive education-to-employment program for over 350 underprivileged, yet exceptionally talented students in Kenya. EFAC's program offers eight years of scholarships, skill-building workshops, and intensive mentoring for secondary and post-secondary school students. Blair Demers joined EFAC in 2015 as Director of Strategic Partnerships, working closely with the board, staff, donors and nonprofit partners to scale the organization, evaluate its impact, and develop a strategic vision for sustainability. A graduate of Princeton University, Ms. Demers holds a certificate in African Studies and has volunteered, studied, and traveled on the continent throughout her youth and into adulthood. Prior to moving to Portsmouth, Ms. Demers served in a variety of capacities for SMART, a start-up educational organization serving talented, low-income middle school students in San Francisco. Her tenure there spanned six years and included the positions of Program Director, Development Director and Executive Director. After returning to the east coast, Ms. Demers joined the Seacoast Women’s Giving Circle in 2007 and was an integral participant in its growth as a local fundraising and grant-making organization in New Hampshire. Serving as chair of the Giving Circle from 2010-2012, she managed a strategic planning process with regard to the group’s membership, fundraising, grant-making, organizational structure, and sustainability. Ms. Demers also serves as vice chair of the New Hampshire Charitable Foundation’s Regional Advisory Board on the Seacoast, and chair of their grants committee. Ms. Demers lives in Portsmouth, NH with her husband and three daughters. For the last several years, Carolyne Musyoka has dreamed about attending college in the US. Carolyne’s dream became a reality in April, when Dartmouth College named her a King Scholar, a highly competitive and prestigious four-year scholarship program reserved for high-achieving students from developing countries. King Scholars receive ongoing academic mentorship and course development that focuses on leadership and international development. She is the first EFAC student to attend a US university. Carolyne placed in the top 1% nationwide on the Kenya Certificate of Secondary Education (KCSE), the test all Kenyan students take at the conclusion of high school. Her impressive A on the exam won her the scholarship to the University of Nairobi, the top university in Kenya. A stand-out student leader since primary school, Carolyne scored 407 out of a possible 500 on the Kenya Certificate of Primary Education (KCPE) test, placing her in the top 5% of 8th grade students that year. She was offered a place at Alliance Girls’ High School, one of the top boarding schools in Kenya. While at Alliance, Carolyne continued to place in the top 10% of a very competitive class. She was active in a wide range of school activities, including History Club, freshman class captain, soccer, basketball, and field hockey. A well-rounded student and strong writer, Carolyne had one of her papers published in a journalism competition and competed in regional competitions with the Poetry Club. Carolyne comes from Yatta, a rural farming community roughly 30 miles southeast of Nairobi, where she lives with her parents, grandmother, and three siblings. Like many rural Kenyan families, the Musyoka family income is roughly $600 per year. Carolyne’s father makes and sells metal tools in a nearby town, and her mother is a domestic worker. To help feed their family, her 72-year old grandmother still farms their acre of land. During visits home, Carolyne particularly enjoys listening to her grandmother’s storytelling. On March 3, students across Kenya were both excited and apprehensive to learn the results of the 2015 Kenya Certificate of Secondary Examination (KCSE), which were released by Education Cabinet Secretary Dr. Fred Matiang’i that day. We are proud to say that EFAC scholars out-performed their peers by a very sizable margin, with 100% of our students qualifying for university placements. EFAC scholars averaged a B+ on the KCSE, while the national performance average was a D+. “I felt so happy, and I am hopeful that I will accomplish my career goals,” said Tabitha Nasambu, who scored 73 points (B+). She attributed her performance to “determination, discipline and encouragement from the teachers,” and looks forward to studying nursing at university. Following graduation from Naivasha Girls’ School, Tabitha has been giving back to her community by volunteering at Ortum Girls’ School, her former primary school, where she teaches mathematics and Kiswahili to seventh and eighth grade students. Dominic Munyao, who completed secondary school at Rongai Boys’, scored 70 points (B+) on the KCSE. He hopes to study computer science at university, and attributed his strong performance to “being focused, hard work and cooperating with teachers.” He also is volunteering at Ikanga primary school during break, teaching science and social studies to grades seven and eight. EFAC’s most improved scholar is Sheila Woki, who scored 61 points (B) on the KCSE, up considerably from the D she earned on the mock test. Sheila shares, “I used to feel that I have disappointed my sponsors, but I consistently worked extra hard.” Passionate about farming, Sheila plans to study Agri-economics at university. She is currently teaching mathematics at Naivasha DEB primary school for her community service placement. Thomas Mosioma emerged as the top EFAC scholar, scoring 75 points (A-) on the KCSE. In a phone interview conducted by the EFAC team at Africa Nazarene University, Thomas said, “I felt happy, even though I had hoped to perform better than this. I want to be an inspiration to others.” He attributes his sterling performance to being disciplined and hard-working, and is grateful for the mentorship and help he received from teachers at St. Mary’s Boys School. Thomas plans to study corporate communications, and currently is volunteering at Nandi Referral Hospital as an assistant in the medical store. On behalf of the EFAC community, sponsors and staff, we congratulate the Class of 2016 on their amazing accomplishments. They have made all of us very proud, and we look forward to the next four years with hope and optimism for their futures. Sponsor a student for $500 a year - Double your dollars and your impact. This October a generous donor is matching 10 four-year sponsorships. Join us in sponsoring a student and giving the gift of education to a high school or university student in Kenya. To have your scholarship dollars matched and sponsor a student for $500/year, email us at info@educationforallchildren.org or go to our Donate Page and under "Donation Dedication" tell us that you would like to participate in the matching funds campaign and what gender you would like to support - or if you would like to support a specific student, this is a good place to let us know. For more detailed information, contact us at info@educationforallchildren.org or give us a call at 315-262-6201. Bernard is a Form I student at Makueni Boys School. He dreams of becoming an electrical engineer and bringing electricity to communities across Kenya. In sub-Saharan Africa 10 million children drop out of school every year. EFAC is working to challenge this statistic through access to education and comprehensive education-to-employment programs in Kenya for vulnerable boys and girls. This year EFAC has 6 bright students who need funding to complete their high school education. To see their profiles, or to select a student, you can visit EFAC’s secondary sponsorship page by clicking here. Irene is a first year student at Moi University Pursuing a Bachelors' Degree in Education. Irene hopes to work with students with special needs in her future. Did you know that every additional year of school that a woman attends school increases her wages by an average of 12%. Our university and diploma students receive mentoring and hands-on employment training to enhance their degree programs. EFAC scholars select academic fields that will allow them to serve their communities and country and our EFAC scholars, both male and female are actively involved in giving back to their communities. There are currently nine unfunded university students who are in need of funds to continue their education. To see EFAC's current list of unfunded university students, please visit EFAC's post secondary sponsorship page by clicking here. To sponsor a student for $500/year, go to our Donate page and under "Donation Dedication" tell us that would like to participate in the matching funds campaign and what gender you would like to support -- or if you would like to support a specific student, this is a good place to let us know as well. For more detailed information, contact us at info@educationforallchildren.org or give us a call us at 315-262-6201. Thank you for giving the gift of education. Education For All Children (EFAC) has been selected to join The Clinton Foundation’s No Ceilings Initiative and the Brookings Institution’s Center for Universal Education as a member of the Girls CHARGE Collaborative. The collaborative of more than 50 partner organizations aims to reach more than15 million girls worldwide by 2019. New partnerships were announced by former Prime Minister of Australia Julia Gillard during an event hosted at the annual meeting of the Clinton Global Initiative on September 29, 2015. As an official Girls CHARGE partner EFAC will support and enhance two major priority areas: access to education programs for girls and transitioning programs for girls to ensure successful transitions to higher education, leadership and employment. EFAC co-founder Rod Van Sciver shared his thoughts on this new and important partnership, "EFAC is thrilled to be a CHARGE partner. It is only though true collaboration with like-minded organizations that we can all reach our shared goal of seeing the women of this world reach their innate potential." Launched as a 2014 Clinton Global Initiative Commitment to Action and championed by Former Prime Minister of Australia Ms. Julia Gillard, the Clinton Foundation, and the Brookings Institution, Girls CHARGE brings together over 50 public, private, and civil society organizations and has committed more than $800 million to reach more than 15 million girls in 40 countries by 2019. Addressing issues of school access, school safety, quality learning, life transitions beyond secondary schooling, and local leadership for girls’ education, Girls CHARGE continues to grow and serves a community to share best practices, research, learnings, and monitoring and evaluation models. Ishmael joined the EFAC family in 2011 and was selected as an EFAC scholar for his ambition, hard working nature, and strong academic performance. Born in Kitui district in Eastern Kenya and the fifth born of eight children, Ismael's parents struggled to provide basic needs to their large family. When his primary school teacher brought him the EFAC application, a world of possibility opened for this young man who had not previously considered continuing in school. Innovative, entrepreneurial and still deeply engaged with his home community, Ishmael is a student at Taita Taveta Univeristy College where he studying for a Bachelor of Business and Information Technology. In the post below, Ishmael shares his perspective on his EFAC experience in high school and the leadership skills he has developed as an EFAC scholar. My name is Ishmael Ngei from Katulani village, Kitui County. I schooled at Rongai Agricultural & Technical Secondary School through EFAC sponsorship. I am currently studying for a Bachelor of Business and Information Technology at Taita Taveta University. I am delighted to share my high school and community service experience as an EFAC scholar. I strived to balance my academics, leadership and participation in co–curricular activities. I joined the school teams and played midfield in basketball and table tennis. I joined the wildlife club and we planted and took care of many trees in the school compound. We enjoyed privileges including visiting National parks and game reserves including Lake Nakuru National park. As a student leader, I acted as a student government advisor and Christian union Prayer coordinator and later on I was elected as the school president. I coordinated the student government to deal with discipline issues and as a result there were few disciplinary cases. Academically, I was on the list of top 20 best performing students in the class and I was also able to serve in a variety of leadership positions, which helped me to learn and practice virtues of honesty, hardwork, service to others, management and record keeping. Outside of school, I attended Kenya Student Christian Fellowship annual camps and EFAC workshops throughout my four years in high school. These opportunities allowed me to acquire self-confidence and gain a sense of empowerment. During my final year of secondary school, I was awarded Kshs 4,000 from the school administration. With this money, I went home after doing my KCSE and bought a goat; reared it and later sold it in order to pay school fees for my sister, Janet. Kitui County is quite dry and people in the region experiences water challenges. The pupils fetch clean water from a water vendor and I had countless thoughts on how the water challenge could be settled in my neighborhood community. With this in mind, I composed a poem entitled "Water the Confusion” and I taught it to the students at the local school who later recited it in front of the Governor of Kitui County during his visit to Katulani. He was moved and he promised that the county government will dig a bore hole which will serve as a source of water to the school and the community. Once this project is completed, it will be a lifelong legacy. I remain grateful to my sponsor through EFAC and mentors. My experience in community service was quite challenging but educative. At home, I assisted in carrying out duties like fetching water, cultivating in the garden and grazing. I also did a voluntary work as a teacher and patron in Nzukini Primary school from January to September, 2015. I taught English and Mathematics to primary school students. This gave me an opportunity to influence the pupils to speak national languages at the school. As a result, the pupils improved significantly English and Mathematics during end of term examinations. Students who performed very well on the 2014 Kenya Certificate of Secondary Education (KCSE) national examination have been admitted to join public universities and colleges and will start their studies this month. According to the Kenya Universities and Colleges Central Placement Service (KUCCPS) board, only 80,000 students (out of 480,000 test takers) were given one of these coveted spots. The board set the cut-off point for placement to degree programs at B, a score of 60 points for male candidates, and B-, a score of 58 points for female candidates. Medicine is the most competitive program across all universities, and other highly competitive courses include dental science, engineering (civil and electrical), architecture, pharmacy, and actuarial science. Out of 49 EFAC scholars who sat for the national examinations, 47 have successfully been admitted to join public learning institutions. Some of the top EFAC scholars include Drusillah Mogire who has been placed to study Bachelor of Medicine and Surgery at Maseno University; Shadrack Kiprotich has been placed to study Bachelor of Actuarial science at Karatina University; and, David Nyangaresi has been placed to study Diploma in Civil Engineering at Kabete Technical Training Institute. Founders Rod and Nancy Van Sciver and Board Chair, Corporate partnerships Jay Dinkel attend first Bridge To Employment Workshop. Nancy, Rod and Jay joined 120 secondary graduates and 11 major corporations at the first university workshop. It was a fantastic success for our university students as they underwent mock interviews and prepared elevator speeches and resumes. Some of the students actually landed internships during their mock interviews. EFAC developed its new workshop curriculum in conjunction with its Kenyan Corporate Advisory Board with representatives from Unilever, Nestles, SC Johnson, IBM and Litemore LLC. EFAC students learn employability skills and prepare for the future. With the help of international and national companies we believe EFAC students will continue to beat the odds. As board member Jay Dinkel noted,"the social aspects of EFAC were as stunning and impressive as the skills EFAC students demonstrate." The students share an incredible bond, and for many, EFAC has become like a family. Nowhere was this more noticeable than at the Saturday night dinner dance at the conclusion of the workshop. The hall was decorated with balloons and bright crepe paper, and the night felt like a cross between a 1950's prom and reunion of old friends. Everyone enjoyed karaoke, poetry, dancing, hugs and thousands of smartphone photos, all followed by a surprise celebration of Nancy's birthday. For me, this was one of the trip's highlights, as I witnessed how special this group has become." EFAC is building a strong alumni base that someday will be our best support. One of EFAC's first scholars, Shirlene said it best when she said, "EFAC is family, just being together makes me feel like we are headed somewhere." partnership and the women who make that partnership possible at NH Magazine. On May 1, 2015 the collaboration between Africa Nazarene University (ANU) and Education for All Children (EFAC) advanced to a new level as Prof. Leah Marangu, Vice –Chancellor, ANU and Nancy Van Sciver, together with her husband Rod, founders of EFAC joined hands to launch Career Readiness and Empowerment Training (CRET) under the theme “nurturing character and career development.” The launch was received with cheers of jubilations by over 130 scholars who are currently beneficiaries of EFAC scholarship and mentorship in post-secondary education. The CRET curriculum is a four year program that seeks to equip the scholars with skills and an education that leverages them to be competitive and assertive in modern day professions. Speaking during the launch, Prof. Leah Marangu asserted that “this dream was not in vain. You are the candle that is going to ignite others wherever you go.” She challenged the scholars to “inculcate discipline, determination, hard work and a trust in God” in their journey of academic excellence as well as when preparing for work related responsibilities. Nancy Van Sciver recalled the genesis of EFAC asserting that the launch of CRET was one of the program’s milestones that will play a leading role in transforming lives as well as prepare the scholars to acquire the soft skills which are required in the modern job market. “Since the conception of EFAC we have heard stories of difficulty being transformed to stories of great hope.” she said as she acknowledged her dream to change the lives of the less privileged in Kenyan society who will ultimately change the African continent. The 21st Century employers desires to employ competent employees who can propel the vision and mission of the organization or company to greater heights. This requires the caliber of an employer’s prospective employees to be competent academically, professionally and socially. Furthermore, they should possess a wide range of soft skills such as teamwork, leadership, communication skills, interpersonal skills, positive attitude, problem solving and a strong work ethic. The CRET program aims to enhance scholars skills and further develop relevant competencies including, self-awareness, financial literacy, reproductive health, career knowledge and preparation, employability skills, leadership, and survival skills which will enable them to be productive in the modern job market. The program also allows the scholars to participate in community transformation at a personal level and develop their servant leadership skills through philanthropic and community driven initiatives. Prior to the launch, the workshop commenced on April 19, 2015 with a group of 48 scholars who completed their Kenya Certificate of Secondary Education (KCSE) in year 2014 and they are currently looking forward to joining universities/colleges in September. They were joined by a group of 86 Scholars on April 30, 2015 who are currently pursuing their Degree/Diploma courses in institutions of higher learning from across the country for a two days comprehensive CRET workshop. The scholars had an opportunity to listen, interact, and share their views/ideas with different professionals/career experts who works in both public and private sector. The workshop was of great importance to the scholars as they testified about its impact in their personal and professional development. “The interaction with different individuals from various firms is so helpful in my professional development. I now know how to behave during an interview,” said Pauline Sinyok, a student at Kenyatta University. William Muchui, a student at Thika School of Medical Sciences testified that “I have learned how to negotiate for a job and what to cover when preparing a Curriculum Vitae.” Mercy Obiewa, a student at Rongo University said “it was a wonderful chance and I have learned how to market myself in order to be the most outstanding among the millions of job applicants.” Joan Naeni, a student at Technical University of Kenya pointed out that the “elevator speech and speed mentoring session has made me really evaluate myself and learn how to brand myself.” EFAC’s Kenya team would like to thank all the EFAC sponsors, stakeholders and facilitators who dedicated their time and resources to ensure the success of this workshop. On March, 3 2015 cheers were heard across the country as the Education Cabinet Secretary, Prof. Jacob Kaimenyi released the results of 2014 Kenya Certificate of Secondary Education (KCSE) examinations. Out of 483,630 candidates who sat for the examinations, 3,073 candidates scored an overall mean grade of A. “Overall mean grade of A by gender shows that 2,133 (69.4%) male candidates and 940 (30.6%) female candidates attained this highest grade,” said Prof. Jacob Kaimenyi. He also pointed out that 149,717 candidates scored the minimum university entry qualification of C+. Among the candidates who received their KCSE results were 49 EFAC scholars. The graduating class has done exemplary well as 2 students managed to score a mean grade of A; 13 students scored a mean grade of A minus; 11 students scored a mean grade of B plus and 15 students scored a mean grade of B. And, we are so pleased to announce that all 49 scholars managed to score a mean grade of C plus and above, the minimum university entry qualification. Drusilla Mogire emerged as the top EFAC scholar. She scored an A plain of 82 points. She attributed her sterling performance to “being focused, hard work, determination and mentorship.” Her future career is to study medicine at the university as she stated, “I have a passion for medicine and I had to work extremely hard in all subjects and especially in English.” She is currently doing her community service in a local health Centre. “I would like to study civil engineering at the university,” said Rose Winnie Nekesa. She scored an A minus of 77 points. As an aspiring engineer, she advises the high school students to “not take their education for granted but to work hard and plan their time well.” She is currently doing her community service at Mater Hospital. “I thank God that EFAC stood with me and paid my school fees. I would like to study actuarial science at the university,” said Antony Mulwa. He scored an A minus of 76 points. He is currently teaching biology and mathematics at a local secondary school. Other scholars who have done well include Mercy Lukaya who scored an A minus, Caroline Musyoka who scored an A plain and Richard Amkonyole who scored a B plus. Mercy had to battle stiff competition in her school and plan her time well as she spent one month at home after going through an eye surgery. Richard was the most improved student among all EFAC Scholars. "My highlight and jubilation was Richard, when the results came in. He was the first student I noticed, and he has made us proud," said Godfrey Sakwa, EFAC's contact teacher at St. Mary's Boys. His story is heartbreaking; he is an orphan and he spent almost all the break holidays in school since it was the only place he felt comfortable to stay. He utilized his last two terms in high schools to literally improve his performance from grade C to B+. " Together as the EFAC fraternity, sponsors and stakeholders, we join our hands to congratulate EFAC Class of 2015. Recently 40 new students were awarded EFAC scholarships to attend high school. As part of the admissions process, ANU staff made some home visits to deliver the good news. Here is an account of their visits written by EFAC staff member, Peter Kingori. Chants, jubilation and tears of joy were felt among the parents, guardians, teachers and relatives of 2015 EFAC applicants as they received the good news that they had received education scholarship from the EFAC office, Africa Nazarene University. ‘I pray to God to bless you so that you can continue to empower the needy,’ said Eric Wainana. Eric lives with his mother in a rental house at Kahara village in Kajiado Country. He used to spend three hours per day to walk to and from school. He scored 371 marks on the 8th grade exit exam (Kenya Certificate of Primary Education (KCPE)). Despite his poor background, he is determined to work hard in high school and transform the misfortune of his family. He praised his science teacher for being a role model and mentor to him. He has joined form one at St. Mary’s Boys Secondary school through an EFAC scholarship. “My mother struggled to pay for my fees at primary school. It was mostly paid by well-wishers,” said Tabitha Naserian. Tabitha lives with her mother in a rental single-room, iron-sheet house in Ongata Rongai. When she was in primary school, she missed many days because of lack of fees. Despite her needy background, she scored 375 marks on the KCPE. Her dream is to become an accountant. She has joined form one at Vanessa Grant Girls. "It is like a miracle for me to be awarded an EFAC scholarship. I know that if I am helped, I will achieve my goals,” said Faith Ndanu. Faith lives with her mother and sister in Katoloni village in Machakos County. Like Tabitha, Faith was sent home quite often in middle school due to lack of school fees. Despite the challenges, she scored 391 marks in KCPE. She is thankful to the teachers who kept encouraging her to have a positive attitude. She has joined form one at Vanessa Grant Girls. Each of the EFAC 2015 successful applicants has a story to tell. For instance, Benard Mwengi, an orphan was the top student in his school. He was accompanied by his teachers to pick up his letter awarding him an educational scholarship from EFAC. He scored 376 marks in KCPE. All of the Form One scholars have faced numerous hardships including lack of basic needs such as food and clothes. Listening to their narratives on how they used to go to school without taking breakfast, skipping the lunch meal and living with only one meal per day, but they remained hopeful. With the promise of an education, they can wipe their tears and alter their trajectory of life. It is through the empowerment of an education that these scholars will grow up and bring a positive change in their communities and the nation at large. We are glad that EFAC in collaboration with Africa Nazarene University has granted education scholarship to 40 bright but needy students this year of 2015. Before I joined the EFAC family, life was too hard, terrible and hopeless. I grew up in Sirwa Village, Baringo County. I faced numerous challenges as a young girl but my desire to acquire education was greater than the fear of being a house wife. Prior to being admitted at Africa Nazarene University, I was herding my father’s cattle and goats. However, my desire for a brighter future was cut short after a successful completion of one academic semester at the University due to lack of tuition fee. I had to drop out and go back to my village. I stayed home for one year without any hope of resuming my studies. I am glad that EFAC came in my life and opened the golden gates for me. With EFAC support, I was able to resume my studies and complete my Bachelor’s degree successfully. EFAC impacted my life positively not only academically but also morally and socially as I acquired essential life skills during mentor workshops – we were always challenged to give back to the community. Thus, driven by the desire to mentor and empower young people in my community, I founded Sirwa Mentoring Group (SMG). It was not easy at the beginning but since I had a vision, I was determined to see it mature and touch one or two lives. I approached the college students from the area and they liked the idea and wanted to help out. We organized and sacrificed our resources to fund the first mentorship forum which attracted more than 250 students. This was overwhelming, and it was successful. Since then, most parents and students have changed their perspective about education. I was glad to witness the highest number of students who joined high school that year with an aim of being like Carol or my fellow college students. This mentorship has now become a yearly event in our community and surprisingly parents and leaders have pledged their support. In December 2014, we held our second mentorship event at Sore Primary school and it attracted youth in primary and secondary schools, form four leavers, college & university students, parents, leaders and academicians. I am happy that there are small changes which are taking place in my village - everyone is working hard to ensure their kids go to school. Besides that, my neighboring college students are taking up the mentorship challenge by starting small groups in their villages with the aim of transforming lives. This is a great multiple effect of SMG. Learning from Mother Teresa who once said “I cannot change the world alone but I can cast a stone across the waters to create many ripples,” SMG gives me hope that the world will gradually change into a better place. A noble change starts with an individual who makes a positive change in someone’s life and that person impacts the same to someone else gradually. My passion is to make a difference in other people’s lives. I will use my abilities to fulfill my purpose here on earth. My next step is to organize a big event with the aim of nurturing student talents and help them realize that life is not all about books but being well-rounded. As an EFAC Alumni, I am always thankful to the entire EFAC family; my brothers and sisters in college and high school, Sponsors and all mentors who have made me to be whom I am today. I will forever be grateful and will lift the EFAC flag wherever I go. Finally, I would like to encourage my fellow EFAC scholars that they do not need to have much in order to make a difference, all they need is a willing and caring heart. Blog post by Peter King'ori, a member of EFAC's Kenyan Team. A home constructed of local bricks and a thatched roof. Sylvester is among the 28 scholars who are benefiting from EFAC education scholarship in Kitui County. These students live with their parents, siblings and guardians in areas such as Katulani, Ikanga, Matinyani and Ikutha. A recent home visit by the EFAC team found that small scale subsistence farming is the main source of income for most peasant farmers in these regions. The climate is characterized by dry seasons with minimal short rainfall seasons. Rivers are seasonal and farmers depend on borehole water for drinking and washing. They must pay for their water and 5 liters of water costs 2 Kenyan Shillings. Most of the houses are built with local bricks and either an iron sheet or a grass thatched roof. Illiteracy is common among older parents/guardians and they only speak the local Akamba language. Despite these levels of poverty, these parents/guardians are hopeful for the success of their children. Ishmael together with his mother and siblings. Empowering one student at a time brings joy and hope to families struggling with illiteracy and poverty. Educating younger generations translates to a great future. Students are determined to accomplish their dream and transform their entire trajectory of life in a positive way. Together, let us empower one student at a time with the knowledge that education is the hope for generations. All of us at EFAC wanted to say thank you to our supporters for a a wonderful 2014! We are very pleased to tell you that our recent campaign to secure Emma's junior and senior years of high school was a success, and Emma will graduate with her class in 2017. We are also pleased to tell you that 150 of the 151 EFAC students in high school are fully funded through secondary school. We have only one more student who needs funding so we can guarantee that he, too, will be able to graduate with his class. During the campaign for Emma, a supporter pledged $500 toward David's tuition -- which means we just need to raise $500 more to guarantee that he can return to St. Mary's Boys School in January. When David was young, his mother abandoned the family and left David and his siblings in the care of his elderly grandmother. While David’s father works as a peasant farmer to help support his children, he cannot afford high school fees for David or his siblings -- but he is very supportive of David's accomplishments in school. In 8th grade, David graduated second in a class of 107 students, securing a spot at top rated St. Mary’s Boys School where he is very happy and doing well academically. Outside of the classroom, he loves singing and writing songs. In a recent letter, David wrote: "I owe you a huge magnitude of gratitude. Actually my words can’t explain it. What a kind heart you have! I understand that it is no joke sponsoring me and trying to help me reach my dreams." To help David reach his dreams, please consider an end of the year tax-deductible gift. DONATE NOW -- the minimum donation is only $10 and 100% goes toward helping David complete his high school education. Just a few short blog posts ago, we had a wonderful puzzle and promised the answer. You can refresh your memory reading the post here. The poem below has four special attributes with a unifying theme. Can you see the theme? English shining linens in eggshell sheen. “Negligees, leggings, high heels,” he sings. Giggling, she senses illness in his singleness. Lessening his lies is senile. Is she seeing his sinning signs? She sighs. He is selling silliness. His highness is senseless in English! We hope you enjoyed this illustration of how education can be fun! Wishing you all a Happy New Year! Good news. Thanks to donors like you, every female EFAC scholar is funded through high school -- except for one student -- Emma. Our goal, this holiday season, it to guarantee that Emma will graduate with her class. Emma is a bright, motivated teenager from Kenya where high school is not free. Her mother was able to raise the fees for Emma's first year of high school but cannot afford to send her back. We need to raise $1000 by December 31 so she can continue her education at Naivasha Girls School. Knowing Emma, we have no doubt she will do whatever she sets her mind to. After high school, Emma dreams of becoming a banker and "helping other needy children find and get an education." Let's make her dreams come true. READ MORE about why it is still so critical to invest in educating girls. DONATE NOW - the minimum donation is only $10 and 100% goes toward helping Emma complete her educational journey. Consider making a difference in her life today. Thanks! People have unique ways of resolving conflicts. Educators always teach the students that fighting and violence do not resolve conflicts. They advocate for healthy ways of anger management and above all embracing reconciliation and forgiveness. Problem solving skills tend to be one of the key competencies that employers are looking while hiring. Education for All Children has been giving eminence to topics that empower students with the 21st century skills during annual workshops. Students are taught to resolve conflicts amicably with their peers, schoolmates, workmates, siblings, parents, teachers and the community at large. Recently, Diana, an EFAC student at Naivasha Girls High School narrated how she reconciled with her friend. Diana’s friend had requested her accompany to a hockey game. Instead, she refused and opted to remain behind and revise for her exams. Afterwards, her friend started saying false things to her schoolmates. She became angry with her and instead of fighting back she opted to write the below poem while controlling her anger. She later recited it to her friend as she sought for reconciliation who initially busted in laughter but later she asked for forgiveness. After all, we are all human. Like the winds, reaping off my trust for you. I’ll be there, so let go of the lime. Is it a miracle what I feel? And feel the warmth that I imagine you do. Too much I took in, too much I supposed. I’m human too, did you know. There are so many ways to make learning fun. Plenty of good stuff is available to teach people who are motivated to learn, but how can we increase their motivation? People who really enjoy a topic are much more motivated to educate themselves. Take language for example. English is a complex human creation, and it is as quirky as those of us who speak it. We expect certain structural attributes: symmetry, regularity, consistency, and logical construction of words and phrases. In general, our language delivers well on these features, but occasionally, or even quite frequently, quirks surface. A whirlwind tour through some counterintuitive usages illustrates this point. A slim chance and a fat chance mean the same thing. A wise man and a wise guy are very different. Unto means the same as to in most usages. Quite a few means quite many. Pineapples have nothing to do with pines or apples. A house can burn up or burn down with the same outcome. Filling in forms and filling out forms produce the same results. We have noses that run and feet that smell. We fire employees who hardly work and praise them if they work hard. Folk and folks are both plural and mean the same thing. Nonword is a word. Furious means full of fury and joyous means full of joy, but gorgeous does not mean full of gorge. A man with hair sounds much hairier than one with hairs. Why can’t people be chalant, plussed, combobulated, or gruntled? Why can we remember things when we never membered them to begin with? And finally, observe that stifle is an anagram of itself. These peculiarities might confuse some people, but to me they represent the spectrum of opportunities for surprise and wonder that make English so powerful, puzzling, humorous, and entertaining. It is a remarkably beautiful language. We can also enjoy English with a puzzle that employs some simple poetic license. The poem below has four special attributes with a unifying theme. Can you see the theme? It is a remarkably beautiful language. In this short blog, my sole purpose was to point out some opportunities in making a dull topic like language more entertaining to learn. Enjoying a topic motivates us to stay interested even when the lessons are not that much fun. What they don't teach enough of in school is how to enjoy a topic. We mentors, parents and coaches can help reinforce the fun in learning. Walker Royce is the Chief Software Economist at IBM and the author of three books. Walker and his family are also EFAC sponsors. The traditional African proverb “it takes a village to raise a child,” depicts the expected collaboration in all levels of life while nurturing children. Research has shown us that children who are connected with numerous caring adults tend to do well in life. They are armed with resilience that enables them to step up and respond positively to life challenges. As the students mature, they need connections with caring adults who ask them: What are your ideals? How is your self- esteem? Do you value yourself? What is your dream career? How often do you evaluate your journey of moral and academic excellence? These kinds of questions provide a road map for life. Esther Wagaki sharing a word of advice to Valentine Ngigi, an EFAC Scholar at Vanessa Grant Girls School. Thank you to each of the EFAC mentors, as we continue to impact one life at a time! Mona Kyle, is a volunteer from California who is volunteering with EFAC in Kenya for three months. Mona is living and working at the Vanessa Grant Girls School (VGGS) in Rongai, Kenya, a partner school of EFAC. EFAC students attend secondary school at VGGS. Mona has been teaching Yoga classes during her time there, read Mona's description of their last class together. Yesterday I taught my last Yoga class at VGGS. Although I was a little skeptical when the idea to teach Yoga during my time in Kenya was first suggested, and getting the mats here proved to be more problematic than I anticipated, the entire experience was fantastic. When we began, very few, if any, of the girls had the slightest idea of what the practice of Yoga involved. Most of those who had heard the term were under the impression that it was just some type of meditation. When we started moving (and breathing) into various postures, I think my students were pleasantly surprised to learn that our practice would not only improve their flexibility, but their overall level of fitness. After a 90 minute class, the girls always embraced our final relaxation, and left for dinner ready to face another three hours of studying. I am happy to report that I have found two girls who are willing to take over my classes by forming a Yoga Club in January, and both of these girls happen to be EFAC scholars. One of the girls is Fraziah. She is a natural, and has challenged me to come up with something new and exciting for each and every class. Unfortunately, Fraziah is a Form 3, so come next September, she will essentially be sequestered as she does her final preparation for the KCSEs. Therefore, Ann Sammy (Form 1) will be working with Fraziah so she can step in when it is necessary for Fraziah to remove herself from the practice. To assist them in their endeavors, I am leaving behind not only the mats, but a book on Yoga, an outline I have prepared describing the basic class I have been teaching, as well as some cleaning supplies to extend the life of the mats. I am confident that Fraziah and Ann will do an excellent job of keeping Yoga alive and well at VGGS. Mona Kyle, is a volunteer from California who is volunteering with EFAC in Kenya for three months. Mona is living and working at the Vanessa Grant Girls School (VGGS) in Rongai, Kenya, a partner school of EFAC. EFAC students attend secondary school at VGGS. Read Mona's description of a recent retreat for students at the Vanessa Grant Girls School. On Thursday, November 6th, in order to reward those students who excelled during Term 2, and to provide an incentive for those who need to improve, VGGS took the top three (3) students in each section (there are three sections in each Form – “V,” “G,” and “S”) of Forms 1, 2, and 3 to Kivu Retreat, a hotel in Nakuru with two fantastic swimming pools. Unfortunately, the Form 4 Candidates were still taking the KCSEs. The “Most Improved” students in each section and the top three (3) performers of Forms 1, 2, and 3 in the Mathematics Contests were also included. I am pleased to report that many EFAC scholars made the cut. In fact, EFAC scholars swept section “G” of Form 1 with Irene Linah coming in first, Rehema Matua second, and Joyner Wambui third. Irene also qualified for this outing as the “Most Improved,” and with the top Form 1 performance in the Mathematics Contest. Stacy Murungi was also recognized as the #2 student in section ”S” of Form 1, Abigael Muia was the #1 student in the “V” section of Form 2, Pamela Achieng was the #3 student in the “G” section of Form 2, and Dorcas Mwango was the #1 student in the “V” section of Form 3. Fraziah Njeri also qualified with the third best performance in the Form 3 Mathematics Contest. It was quite an impressive showing for EFAC. After swimming, the girls were also provided lunch, and, judging by their appetites, it was a welcome change from the food served in the dining hall. A wise man once said “there is a time for everything, and a season for every activity under the heavens.” Likewise, the long awaited day October 21, 2014 dawned a hopeful day for the 485,547 candidates of the 2014 Kenya Certificate of Secondary Education (K.C.S.E.). It’s a day that all the candidates across the country sit for their English paper in National Examination. K.C.S.E. serves as a bridge between high school and college/university life where the students are able to specialize in a few subjects and pursue their careers. It also marks an important transition of the students from childhood to adulthood. The Kenyan education system is structured in a manner that by the time a candidate is ready to sit for his/her K.C.S.E. they are already or about to turn 18 years old. In Kenya an 18 years old person is eligible to apply for an identity card which acts as legal document in defining a person transition from childhood to adulthood. EFAC team with form four students at Stahrehe Girls School. Among the 485,547 candidates, EFAC is glad to have sponsored 48 scholars. Prior to the exam period, the EFAC team participated in the prayers day in the respective school of each scholar to give them encouragement and moral support. The prayers day brought together the parents, friends, siblings and relatives who made their way to their daughters/sons schools to wish them the best and pray for them as they prepare to sit for their final exams. The prayers day is usually a solemn assembly where the entire school fraternity joins in unison to dedicate their candidates to God. This is because the success of one student means the success of the entire school. This is enshrined in the African spirit of “Ubuntu” where the joy or success of a person is attributed as the joy or success of the entire society. Mona Kyle, is a volunteer from California who is volunteering with EFAC in Kenya for three months. Mona is living and working at the Vanessa Grant Girls School (VGGS) in Rongai, Kenya, a partner school of EFAC. EFAC students attend secondary school at VGGS. Read Mona's description of Prayer Day at Rongai Boys School. Prayer Day at Rongai Boys’ School was held in early October. Since this is a Christian Brothers School, there was quite a bit more emphasis on prayer than on entertainment. The program consisted primarily of a Mass, which was held in the dining hall. It was a treat to hear the powerful voices of the Rongai Boys’ choir singing throughout the service. After the Mass, the congregation of students, family and friends was addressed by the Headmaster, Bro. James Thiongo. Bro. James commended the candidates on their ability to work together, and assured them that as a result of their teamwork he is certain that this class will do particularly well on the upcoming exams. The Head boy, Ismael Ngei, an EFAC scholar, was the next speaker. Ismael gave a very moving speech in which he noted that these candidates were essentially in the same position in 2010 as they are in now because they were preparing to take their KCPEs (Kenya’s 8th grade exam). At that time, they were only boys, but in the past four years they have become men, and Ismael believes they have, in fact, become men of substance. He credits their progress to putting God first, and respecting not only their parents and teachers, but also themselves. He thanked the parents for their love and support throughout primary and secondary school, and the teachers for their assistance and persistence in imparting the knowledge necessary to complete the syllabus before the end of the term. Ismael also acknowledged his gratitude to the faculty for their advice and guidance over the past four years. Finally, Ismael expressed his appreciation to his fellow candidates for exhibiting character, discipline, focus, and cooperation. Before the students were dismissed, the mother of one of the Form 4 boys spoke on behalf of all of the candidates’ families. She stated that because much is expected of their sons, all of the families need to pray for their success. She thanked the teachers for their support and guidance, and for imparting the knowledge necessary for their sons to be successful not only on the KCSEs, but in life. She concluded by asking the candidates to take care of themselves, to ask God for assistance, and to remember that they are brothers and need to work together. After the service all of the students were permitted to spend the afternoon with their families. The EFAC scholars were gathered in the library by Carol Ngetich, Samwel Mwiko and George Mwangi. When asked to share their impressions of the Mentorship Workshop, almost every student commented on the significance of something said either by the Principal of Alliance Boys’ School or by Johnson Mwakazi, and each stressed the importance of time management in handling their busy schedules. Samwel, is not only a Rongai Boys' graduate, but was also a mentor at the workshop in August, and it was obvious the boys could relate to him as they listened attentively to his words of wisdom. George Mwangi, who had been a teacher at Rongai Boys’ School and is now an EFAC mentor, advised the boys to soften their hearts so they can be molded, and stressed the importance of giving back to their society. After my friend Joe graduated from Yale in 1966, he went in the Peace Corp where he was assigned to teach school on a small South Pacific island in Palau, Micronesia. He arrived with his duffel of cloths to find a small hut with a dirt floor which was to be his classroom and six young children who spoke no English. Joe said he was never very good with languages so if he and the kids were going to communicate, it was going to be in English. So the first day, they started learning to communicate. As time went by, the kids learned Joe’s language. Having no book, Joe made up his curriculum on the fly. He talked about history and geography. They lay on the beach and counted the stars. He played math games in the dirt. After two years, he returned to the US, having had an enriching experience but wonder if his two years on the small island had been a throw away. When Joe turned 65, his son James said, “I want to go to Palau with you. I want to meet your students.” Joe thought it was a wonderful idea. What they found speaks to the power of education. All of his students still lived on the island. They, their children and grandchildren all spoke flawless unaccented English. One of his students owned a successful fish export business. Another served on the Micronesia Fishing Commission that negotiated the licensing and revenue sharing model for tuna caught by foreign fishing fleets in Micronesian waters which turns out to be half of all the tuna caught in the Pacific and a major source of income for the islands. No Joe, you didn’t throw those years away. In fact, what you gave those six children will continue to reverberate well beyond our years. Mona Kyle, is a volunteer from California who is volunteering with EFAC in Kenya for three months. Mona is living and working at the Vanessa Grant Girls School (VGGS) in Rongai, Kenya, a partner school of EFAC. EFAC students attend secondary school at VGGS. Read Mona's description of Prayer Day at VGGS. Earlier this month was the 3rd Annual Prayer Day at VGGS. Unlike many secondary schools in Kenya that have an Open House, a family Visitation Day, and a Prayer Day, in an attempt to reduce costs and disruption to the academic schedule, Nancy Mwaniki has decided to combine all three events into one, with the emphasis on mentally, emotionally, and spiritually preparing the Form 4 scholars for their upcoming KCSE ordeal. In essence, Prayer Day acknowledges that VGGS has done its part to prepare the candidates for the examinations and enter into the next phase of their lives, requests the candidates’ parents and guardians to pray for their success, and culminates in the act of placing the candidates in the hands of God. The day began with the raising of the flag before an assembly of the entire student body, faculty, and VGGS trustees, and the blessing of the classrooms in which the candidates will be taking the KCSEs by one of the trustees, Lyndon Bowring. This was followed by a procession to the field by the students, faculty, trustees, and, of course, the candidates, where they were greeted by their parents, families and friends. The program began with entertainment and presentations from the candidates together with the other students. This included singing and dancing by various groups, as well as the VGGS choir. Gogar Primary School also participated in the program with a couple of skits and several musical offerings. The sermon was delivered by Lyndon Bowring who focused on the VGGS Ethos that “truth, integrity and humility are central to everyday living following the examples set by Christ,” and its motto, “Education Today for Leadership Tomorrow.” Mr. Bowring concluded by saying that every day is today, and every day we are alive we should continue to learn since that is what being a disciple truly means. The principal advised the candidates that in order to create a meaningful legacy they will need to surround themselves with good people who have similar interests and moral character, recognize and continue to develop their abilities, and avoid compromising their personal integrity. The deputy principal thanked the parents, and the faculty and staff for all the support and encouragement they have shown the candidates during their entire time at VGGS. There was a final surprise presentation by the candidates themselves in which they sang a “Song of Thanksgiving,” individually acknowledging and showing their gratitude to the trustees, administration, faculty and staff. It was a very sweet song, and everyone was genuinely moved by the sentiment. The closing prayer was delivered by one of the parents. After the program the students spent the afternoon with their visiting families. Their families brought home cooked meals which they were able to enjoy as picnics. Some of these picnics were pretty elaborate affairs. It was nice to see that those students who did not have any family visiting were often invited to join those who did. A couple of girls even invited me to join their family for chapati and mukimo, my favorite Kenyan dishes. Mona Kyle, is a volunteer from California who is volunteering with EFAC in Kenya for three months. Mona is living and working at the Vanessa Grant Girls School (VGGS) in Rongai, Kenya, a partner school of EFAC. EFAC students attend secondary school at VGGS. Read Mona's description of Kenya’s KCSE exams, something all of EFAC’s Form 4 students are currently taking. The significance of the KCSEs in the Kenyan education system tends to be a little overwhelming, not only to the candidates, but even to the casual observer. The KCSEs are currently being administered on every secondary school campus across Kenya, and I am witnessing the effects of the exams at VGGS first hand. KCSE stands for the Kenya Certificate of Secondary Education, and is taken by all Form 4 students at the completion of their secondary education. KCSE candidates are tested on a minimum of seven subjects. For grading purposes, the candidates must take all three compulsory subjects (English, Kiswahili and mathematics), at least two sciences (biology, physics and/or chemistry), one humanities (history and government, geography or Christian religious education), and at least one practical or technical subject (home science, art and design, agriculture, computer studies or business studies). The grading of the examination is as follows: A (80% and above), A- (75-79), B+ (70-74), B (65-69), B- (60-65), C+ (55-59), C (50-54), C- (45-49), D+ (40-44), D (35-39), D- (30-34), E (0-29). In Kenya, this examination determines admittance to public and private universities. The passing mark for the 2013 exam was a minimum score of 60% (B-) for males and 58% (C+) for females. Students who attain a grade C or below have the option to enter a diploma program such as mechanical engineering, clinical medicine, wildlife management and other options that also provide opportunities for employment in the future. Once admitted to a university, a student’s KCSE score also determines what course of study he/she will be permitted to pursue. For example, in order to study medicine, one would need to have As in the four core subjects of English, mathematics, biology and chemistry. Similar requirements exist for every other major offered. The KCSEs are in full swing. The process began on Tuesday, October 14th with the Computer Studies written examination, followed by the Computer Practical examination on the 15th. It should be noted that the security surrounding the test questions is very stringent. The examination booklets for all of the local secondary schools are delivered to the Rongai Police Station, and then each subject is individually distributed to the schools on the exact day of the examination with an armed guard, who remains on the campus while the test is being given, collects the completed examination papers, and returns with them to the police station for safe keeping. Similarly, the day before the Chemistry Practical exam was given, it was necessary for Mrs. Mwaniki to go to the police station to pick up the chemicals that would be used for that examination. There are breaks in the exam schedule (for example, Oct. 20th is a national holiday, i.e., Mashujaa or Heroes’ Day to honor all those who contributed to the struggle for Kenya’s independence), so the last day of the KCSEs is not until November 3rd, when the candidates will sit for the Biology Practical exam. It has been very quiet on the VGGS campus (even Rongai Boys’ is somewhat subdued) as the lower forms have been very polite and respectful of their older schoolmates, and they contemplate what lies ahead for themselves. The armed guard who has been on campus at VGGS since the start of exams, which is standard procedure. On January 2013 in the Standard Newspaper, Kenyan Ministry of Education, Science and Technology stated that “top marks alone will not assure excellence.” The Ministry stated that schools in the future will be ranked on the basis of academic excellence and other parameters such as good governance and leadership, talent development and character formation aimed towards nurturing well-rounded students. This effort stands to be of great importance as the 21st Century employers are not only looking for qualified and competent employees but people who also possess the necessary soft skills to fit in the modern work force. These soft skills include ethics, communication ability, working well with others, problem solving ability, interpersonal skills and positive attitude, among others. Since then, the ministry has taken significant strides to recognize outstanding schools which are contributing immensely in nurturing well-rounded students during national release of academic results. These government efforts to align education with employer demands requires numerous stakeholders to work collaboratively in order to create collective impact while raising lifelong learners. Education For All Children (EFAC) in collaboration with Africa Nazarene University (ANU) and diverse sponsors from across the globe are in the forefront of transforming lives of the bright disadvantaged students’ from numerous region in Kenya. EFAC students are provided with the opportunity to attend an annual mentorship workshop. During the workshop, students are empowered with values, life skills, IT skills, leadership skills, competencies and career guidance that positions them to succeed in life and the world of work. Through these workshops, various scholars have been able to unearth their unique abilities and rise up to fulfill their potential in life. Numerous students have demonstrated outstanding leadership qualities in their school student governance; proactive participation in school drama and music festivals, sportsmanship and essay writing contests, among others. Recently, Wycliffe Nackeel, an EFAC scholar emerged to be the winner in a “Sexual and Reproductive Health Youth Poster Contest” which was organized by Segal Family Foundation. He received a fabulous award during the Segal Family Foundation Annual Meeting held in Arusha, Tanzania. In his acceptance speech, Wycliffe moved the audience as he narrated how EFAC, teachers and mentors have impacted his life thus far. He said “talent is what I have learned to tame.” Wycliffe’s passion for art, drama, and poetry made led his former primary school to win the district drama and music festival. He played a key role in composing the play and teaching it to the pupils and teachers. In his recommendation letter, the head teacher praises him as a scholar with “a great degree of talents in poetry, painting and drama.” It’s our hope as the EFAC family in collaboration with stakeholders of good will that we will continue to touch and transform lives in Kenya by nurturing students’ talents, character formation and leadership abilities besides simply academic excellence. A generous EFAC sponsor has donated 6 four-year matches giving you the opportunity to sponsor, communicate and mentor a student for only $500 per year. We have 14 bright but impoverished students in Form 1 of high school that need sponsors in order to complete their high school education. In sub-Saharan Africa, 10 million children in sub-Saharan Africa drop out of school every year. That is a staggering statistic. While we know can't help all of them, we know we can guarantee that 6 more deserving students will complete high school with your support and the 2014 Double your Dollars campaign. Simon Peter is one of our unsponsored Form 1 students. Simon Peter lives with his grandparents, aunt and young cousin Jimmy in Nyeri. His father abandoned the family before Simon was born and Simon's mother was unable to care for him so his grandparents have raised him but were unable to raise the fees to send him to secondary school. But, thanks to EFAC, Simon has started his first year of high school at top-rated St. Marys Boys School but needs a sponsor to help him complete his education. Simon's favorite subject is Geography and he loves to play basketball. In September, he attended the EFAC Mentor Workshop at ANU -- his first time to travel to Nairobi (95 miles from Nyeri) -- and he loved seeing the buildings, like Parliament, which he had previously only seen as pictures in books. To read more about Simon Peter and the other Form One students, click here. Unsponsored students are indicated by a red "Needs Funds" on their photo. To sponsor a student for $500/year, go to our Donate page and under "Scholarship Details" tell us that would like to participate in the matching gift campaign and what gender you would like to support -- or if you would like to support a specific student, like Simon Peter, this is a good place to let us know as well. “You planted a seed in a desperate heart where there was no hope before.” Education For All Children (EFAC) graduate, Samuel Amwai wroteto me in a recent letter. When I first met Samuel, he was a street boy in Kenya. He applied for funding to attend secondary school through Education For All Children (EFAC), a Kenyan nonprofit organization (NGO) I co-founded in 2008. I’m proud to say, Samuel is another one of our success stories. He is now a local university student studying business. Transforming a child’s life comes from the support of the community, local NGOs and donors, but the real impact is seeing the systemic change that can start with just one student. Not only is Samuel a university student, he is also using his education and experience to mentor other street boys. He wants younger boys to know that there is more opportunity out there for them, and they don’t have to live on the streets. I’ve seen Samuel’s success every step of the way. As one of his advocates, I’ve been rewarded with one-on-one feedback, but I’m just one individual and EFAC is just a small NGO. I’ve struggled with a question that is all too common: Can small NGOs operating in developing countries really make a global impact if their reach stops at a few hundred beneficiaries? My simple answer is YES. I believe that Education For All Children and similar grassroots organizations can create systemic change because of their unique understanding of the culture and communities in the countries where they work. Having local management creates trust in the NGO and their deep roots in the community ensure sustainability. EFAC has a local board and team on the ground that executes and designs the programs, ensuring that our programs are reinforced throughout the community. This intimate understanding of the local community is something that larger bureaucratic organizations have trouble duplicating. Now that we know we CAN make a global impact, the question becomes HOW do small NGOs make a significant impact? Larger NGOs can measure their impact in the 1,000+ people they reach with their services. Smaller NGOs can’t compete using the same metrics. At EFAC, we’ve come to understand that even a few hundred students can create systemic change. We invest a lot of time and resources into our students. Our eight-year program provides scholarships from ninth grade through university. We also partner with 7 high schools and provide a robust and innovative year-round mentoring program for secondary and post-secondary students. The price tag of our hands-on approach and success rates is only $83 a month per student- a small cost for the opportunities gained! EFAC is in its sixth year of operation and has seen two classes of high school graduates, a total of 96 graduates with 97% enrolled in higher education. Read more about EFAC’s secondary school graduates and their success. Besides measuring graduation rates and enrolment in university, I measure our success in how students give back to their communities, by starting girls’ empowerment programs, mentoring younger students and actively participating in the EFAC community service program. Two recent EFAC associated initiatives exemplify the kind of systemic change we create beyond the classroom. Samwel Mwiko, an EFAC university student, founded Eagle Mentorship Group. Two other EFAC graduates helped Samwel organize a workshop with the mission of, Ensuring the youth make informed choices. The workshop had more than 75 youths in attendance. Samwel and his classmates are taking the skills they’ve learned into their communities to insure that other youths have the same opportunity for success that they had with EFAC. EFAC Graduates Become EFAC Mentors. Recently our Kenyan team, headquartered at African Nazarene University (ANU), sent six EFAC/ANU team members to assist a partner secondary school. The school was having a major issue with students’ indiscipline. Our team engaged the students in focus group discussions on strategic issues and possible solutions to the problems. Working collaboratively with the school’s administration and faculty, progress has been made along with a follow-up training for the peer counselors. Although this is not part of our formal program, our grassroots structure allows us to help the schools we work with to ensure a better education for the students. Margaret Mead said, “Never doubt that a small group of thoughtful committed citizens can change the world; indeed, it's the only thing that ever has.” At EFAC, we are making our global impact one student at a time. The growth is not linear, but exponential as the students and staff gives back to their communities creating positive systemic change. Mona Kyle, is a volunteer from California who is volunteering with EFAC in Kenya for three months. Mona is living and working at the Vanessa Grant Girls School (VGGS) in Rongai, Kenya, a partner school of EFAC. EFAC students attend secondary school at VGGS. Read Mona's description of a a day in the life of a VGGS student. The bell that is run to single all of the day's events at VGGS. A typical day for students at Vanessa Grant is long and demanding. Prior to this term, the girls were required to be up and out of bed at 4:00 am in order to report for “preps,” or individual study in assigned classrooms until the 5:00 am bell beckoned them to return to their dorms for showers and to tidy up their personal spaces. However, this term the new principal, Nancy Mwaniki, has made the 4:00 - 5:00 am “preps” time optional (only for those students who really feel the need to get in an extra hour of studying, primarily Form 4s), so the first bell is now rung at 5:00 am, providing a half hour for them to get cleaned up and report to their dormitory common rooms for devotions. (It should be noted that there is no warm water in the dorms, so showers tend to be quick and efficient. I was assured by Nancy’s daughter, Joyce, a university student in Njoro, that cold showers are not uncommon in Kenyan secondary schools.) It is the responsibility of the prefects to make sure everyone arrives at devotions by 5:30 am. Devotions are supervised by the Christian Union members, and these daily gatherings begin with silent prayer, followed by the reading of a Bible verse and its interpretation, and conclude with a final prayer led by a CU member. At 6:00 am the bell is rung for breakfast in the dining hall, and the girls return to their dorms at 6:30 am for “chores,” i.e., cleaning their rooms and bathrooms. Classes begin promptly at 7:00 am. Most classes are 40 minutes long, but Math, English and Kiswahili are expected to meet 7 or 8 times each week, which often requires double sessions, or at least one 80 minute period for these subjects each week. After three class periods, there is a short break at 9:00 am. On Monday and Friday, this break is actually an assembly of all the students and faculty which includes a formal raising of the flag, singing the national anthem, and announcements from students and the TODs (Teachers on Duty) addressing such issues as tardiness and excessive noise during “preps.” The assembly usually ends with some inspirational words from the Deputy Principal, stressing the need to aim high and work hard. On Tuesday, Wednesday, and Thursday the 9:00 break is dedicated to leadership and house meetings. Classes resume at 9:30 am, and continue until the official Tea Break at 11:10 am. Tea, or more accurately “chai,” a very sweet, warm drink of tea, milk and sugar brewed together, is served in the dining hall with “mandazi,” a semisweet, deep-fried, triangular doughnut. There are two more class sessions before the girls break for lunch at 1:10. That’s a total of seven lessons before lunch. order to get the girls excited about spending additional time each week studying math. Supper is served in the dining hall from 6:00 to 6:30 pm. As with all other meals, the girls are assigned to a table which seats 10 – 12 for the entire year, and the student who is acting as “table girl” brings the food from the kitchen to the table and serves everyone seated there. Each girl is responsible for bringing her own cup, plate and utensils to meals, and washing and storing them after they have eaten. After supper, the students return to their assigned classrooms for “Recap” where they quickly review the subjects they have studied during the day and discuss their homework assignments. Again, for those girls who are having trouble with particular subjects, remedial sessions may be scheduled with teachers from 7:00 to 8:00 pm. If no remedials have been scheduled, the students all have “preps” from 7:00 until 9:00 pm. At 9:00 pm everyone is expected to watch the news on the televisions in the dorm common rooms. (This is the only time the televisions are turned on, except for three hours for entertainment on Saturday.) Form 1 and Form 2 girls remain in their dorms after the news and get ready for bed. However, Form 3 and Form 4 students are served hot chocolate for a little extra energy so they can do an additional hour of “preps” before lights out at 10:30 pm. The weekend schedule provides little relief. Devotions are still at 5:30 am on Saturday with breakfast at 6:00. After breakfast there is a half hour of “preps”, and then two class sessions from 7:00 am to 9:00 am. There is a ten minute break, and two more classes from 9:10 until 11:10. The tea break with “chai” and “mandazi,” is followed by a General Discussion period from 11:30 am to 1:00 pm. During the discussion period the girls are encouraged to identify concepts and/or issues they are having trouble with and seek help from their classmates. Lunch is served at 1:10 pm, with a general cleaning period until 3:00 pm. The students are not only responsible for cleaning their dormitories, but also the classrooms and offices. Those who finish their designated cleaning assignments early are free to do their personal laundry. There are no washing machines at VGGS (in fact, washing machines seem to be quite a luxury throughout Kenya), so the girls wash all of their clothes by hand in buckets and hang them on the line to dry. The only real free time the students have is on Saturday afternoon between 3:00 and 6:00 pm. At that time, the girls are permitted to watch television in the common rooms, primarily movies and music videos, and they often simply let go and dance! Many students choose to practice their music during this time, so it is not uncommon to hear the new marching band practicing enthusiastically. The time allotted for supper on Saturdays and Sundays is the hour between 6:00 and 7:00 pm. “Preps” resume after supper until 9:00 pm, followed by the news, with lights out at either 9:30 or 10:30, depending on whether the students are in Forms 1 and 2 or Forms 3 and 4, respectively. Sunday begins relatively late with breakfast at 6:30 am, followed by an hour of cleaning. The mandatory church service begins at 8:00 am and goes until 11:00. Once again, tea is served at 11:10 am, followed by an hour and a half of Bible study. Between 11:30 am and 1:00 pm, the girls meet in groups of twenty to discuss the Word of God until they break for lunch. Recognizing how demanding the VGGS schedule can be and the need for the students to be at their best, the new principal has instituted a three hour rest period from 2:00 until 5:00 pm on Sundays. The girls are actually expected to lay down on their beds and sleep, “so they don’t sleep in class.” They then have an hour for “grooming,” at which time they can take care of their hair and do whatever mending, etc. may need to be done. Dinner is at its usual time, and even the Sabbath winds down with “preps” and the news. Just writing this schedule down exhausts me, but the VGGS students all seem to accept it as a necessary way of life in order for them to achieve their goals. All of these girls have big dreams and understand that hard work and discipline are important components of success. Blog below written by Nelson Kirrokor. Nelson is tremendous contact of EFAC who works to coordinate between the Kenyan Board and the partner schools in the southern part of Kenya. I would like to congratulate EFAC for their recent award from the Ministry of Education, Mara Division. I have been an EFAC supporter since the year 2009 when I had an opportunity to meet the co-founders Nancy and Rod Van Sciver, as my guests at the Maasai Mara National Reserve. Since then I have supported EFAC in coordinatingbetween the schools and Kenyan board on the southern part of Kenya to make sure the right students get an opportunity to apply for the scholarship. When Rod and Nancy first shared the idea,I thought it was difficult and would require a lot of time and arrangement but thanks to both boards, the US and Kenyan board, for the efforts and dedication they put in place to make this a reality shorter than I expected. I know this has caused them a lot of time and resources but they may not be able to understand how much is the positive impact thisbringsback to our societies. We are so proud of EFAC scholars already and have a lot of confidence that they will change our society for a better future. This year, the Government of Kenya through the Ministry of Education recognized EFAC as a foundation that is transforming life through education in Mara Division in the Southern most part of Kenya. I was so excited to receive the certificate on behalf of EFAC. I am so proud and happy to be an EFAC supporter. May God bless you all for the great work. We love you and always stand with you. EFAC Volunteer Shares Details of a Student Home Visit, Initial Impressions of two EFAC Partner Schools and More! Mona Kyle, is a volunteer from California who is volunteering with EFAC in Kenya for three months. Mona is living and working at the Vanessa Grant Girls School (VGGS) in Rongai, Kenya, a partner school of EFAC. EFAC students attend secondary school at VGGS. Read Mona's first impressions of her first week in Rongai. "I have been at VGGS for four days now, having arrived on September 4th after visiting another EFAC partner school, St. Mary’s Boy’s School, in Nyeri. St. Mary’s was incredibly warm and welcoming, and Brother Peter couldn't have been more hospitable. While we were there, I visited the home of one of the EFAC scholars, Simon Peter. Simon Peter lives with his grandparents, a 26 year old aunt, and his young cousin, Jimmy. We were greeted warmly and taken to their sitting room where we were first offered some delicious fingerling bananas, and then tea. It was necessary for Simon Peter to translate for us when we spoke with his family. What struck me most about this visit is how proud Simon Peter’s grandparents are of their grandson, and how much love there is in their home. Driving back to St. Mary’s we discovered that when Simon Peter attended the Mentorship Workshop at ANU, it had been his first visit to Nairobi (which is less than 200 km away). When I asked him what he thought about the city, expecting his first impression to be similar to mine, i.e., very busy, noisy, and crowded, his eyes lit up and he exclaimed that he thought it was great. He went on to explain that he found Nairobi to be very interesting because he had been able to view various sights and buildings, like Parliament, which he had previously only seen as pictures in books. His explanation reminded me of the first time I traveled with my son to Rome and he became very excited when he actually saw the Colosseum, the Forum, and the Pantheon, historical sites he had only seen in photos before our trip. Being exposed to new things through travel, no matter the distance, is universally exciting. After arriving at VGGS, I settled in with Nancy Mwaniki, the principal of the school. The following morning we walked down the road to Rongai Boy’s School, another EFAC partner school. Even though the students had just returned from their August break, they were already embroiled in exams, which they referred to as “Openers.” After meeting with the EFAC scholars, we were given a very lively tour of the campus by two Form 4s, Antony Kinywa and Ismael Ngei. They were quick to point out the real name of the school is “Rongai Agricultural and Technical Secondary School,” and proceeded to show us why. They took us to the fish pond where they farm tilapia; the workshop where they repair furniture and machinery; the granary and the kitchen; and, of course, the livestock pens with pigs, goats, cows, chickens, rabbits, and turkeys, and the “shambas,” or fields where they grow kale, spinach, carrots, beets, and potatoes. Although the Form 4 students are excused from agricultural chores in order to prepare for the KCSEs, the lower forms are responsible for taking care of the animals, collecting the eggs, milking the cows, slaughtering the pigs and goats, and tending and harvesting the crops, which, in turn, provide most of the food consumed by the students. A truly amazing system. Yesterday I taught my first Yoga class here at VGGS. I was initially upset because I had shipped 25 yoga mats to Kenya about a month ago, but only half of them had cleared customs by the time I left Nairobi. Since I only have a dozen mats, the Deputy Principal, Josphat, selected twelve girls to participate in the initial class. We unrolled the mats in the common room of one of the dorms, and I began their introduction to Yoga. When I asked some of the girls at the Workshop whether they had heard of Yoga, they either had not, or they had the impression it was simply a form of meditation. The girls here at VGGS did not seem to have any preconceived ideas about Yoga, or, at least, they did not care to voice them. I explained to the class that Yoga comes from a 5,000 year old Indian tradition, and that Hatha Yoga, the form of yoga I will be teaching, comes from Sanskrit words which mean “to join” or “to yoke” the body to the mind “through determined effort.” I further explained that I would be teaching them physical postures and breathing techniques to help them find this union and create harmony between the mind and body in order to achieve emotional balance, which should leave them better equipped to deal with the demands of being students here at VGGS. As we began to move into some of the basic postures, other curious girls joined the class without mats, and a few even jumped up on the tables that had been pushed to the side to make room for the class, so they could participate as well. I had a wonderful time sharing something I love with such a receptive group, and the girls seemed to enjoy it as much as I did. After class I spoke with Josphat to see if I could offer several Yoga classes during the week so that more girls could participate, and I think he is going to try to fit this into their schedule. Today was also very special. I attended the Sunday service. It started with a number of songs/hymns sung by the girls in both Swahili and English. The beauty of close to 400 young voices singing so harmoniously was very moving. After almost 30 minutes of music, the congregation was addressed by Josiah Aeteh, a faculty member, who welcomed them back to school, and then by the Deputy Head, Josphat, who introduced the theme of having a positive attitude, dreaming big, and working hard to achieve those dreams. A similar theme was addressed by the pastor whose sermon stressed that all things are possible when we turn our lives (and problems) over to God. He ended with the traditional hymn “How Great Thou Art,” which was beautifully sung in Swahili. Josphat concluded the service with a prayer in which he asked God, among other things, to look after me so I would not regret my decision to come to VGGS. I don’t think I could ever regret coming here." Mona Kyle, is a volunteer from California who has committed to volunteering with EFAC in Kenya for three months. Mona recently arrived in Kenya, where she spent three days at the secondary student workshop hosted at African Nazarene University (ANU). Mona is now living and working at the Vanessa Grant Girls School (VGGS) in Rongai, Kenya, a partner school of EFAC. EFAC students attend secondary school at VGGS. Read Mona's first impressions of the workshop, the EFAC students, and her initial days in Kenya below. "I was incredibly impressed with how disciplined and respectful the EFAC scholars are. On the first day of the workshop, these kids, many of whom had spent hours on matutus (small buses) in order to get to ANU, were up and at breakfast by 6:30 am, and after 7:30 devotions and announcements from the mentors, attended lectures and presentations ranging from Building Positive Self Esteem and Peer Pressure to Setting SMART Goals and Effective Time Management until after 6:30 pm when they broke for dinner. Although the speakers were highly qualified and very engaging, I cannot imagine American teens sitting on hard, molded plastic chairs for that long and still being receptive to the information presented. The students followed pretty much the same schedule the second day, but there was an additional speaker after dinner, Johnson Mwakazi, a former local newscaster who was very charismatic, and, again, the students gave him their undivided attention. The final day was a little more relaxed, but students were still up at 6:30, and after breakfast and devotions, listening to various speakers and participating in break-out sessions until the final dinner, which included a very lively talent show and school presentations. The mentors were all very personable, and did an amazing job keeping the students energized while shepherding them from one activity to another. EFAC's Kenyan Team and ANU should be commended for organizing this event and lining up such a remarkable group of speakers. My second observation from my time with students was how important it is to the EFAC scholars to hear from their sponsors. I can’t count the number of times I was approached by students and asked whether I knew their sponsor. Unfortunately, since I am from Los Angeles and new to EFAC, I found myself trying to explain to kids with a very limited understanding of American geography, that most of the EFAC sponsors are on the East Coast, and I really did not know anything about them since we had not had an opportunity to meet. I was able to work with a smaller group of students on the second day of the workshop when I had the Form Three scholars fill out their questionnaires. At that time, I distributed the letters that had been sent from sponsors via Sheila to the workshop. It was clear how disappointed students were when they did not hear from their sponsors. Students who received letters were more than happy to share them with their friends. Finally, I will share one of my embarrassing moments. On the second day of the workshop, the students were divided by form into discussion groups in order to talk about some of their school experiences with each other and their mentors. I was listening to the Form Two students talk about how demanding their school schedules are when I heard a couple of VGGS girls mention RATS. Since I was on my way to VGGS I was more than a little concerned to hear several VGGS girl indicate that the RATS at their school were adding to their stress. I assumed the girls were referring to the nasty little rodents we are familiar with in the U.S., and was definitely relieved to learn that RATS are, in fact, a type of “pop quiz.” In fact, now that I am on the beautiful VGGS campus I can see how ridiculous my fears were, and I have learned that RATs actually stands for Random Assessment Tests." Thank you Mona! Mona is an experienced yogi and wanted to bring the peace she feels on her mat to the students in Kenya, so she sent 25 mats ahead of her to Kenya. Mona taught her first yoga class to VGGS students on Saturday morning and it looks like it was a full house! Education For All Children is excited to introduce you to our newest volunteer – Mona Kyle! Mona is travelling to Kenya on August 25th and will live and volunteer there at an EFAC partner school, the Vanessa Grant Girls School, for 3 months. Mona is from Malibu, California where she has lived for 25 years. Mona is a J.D. and recently went back to school to earn a certificate to teach English as a second language. Mona believes in education, and that education is what is going to help us survive as a people in each and every country across the globe. Looking for an opportunity to give back and do something of value at this stage in her life, Mona was in the process of considering the Peace Corps when she had a serendipitous meeting with EFAC Founder, Nancy Van Sciver. 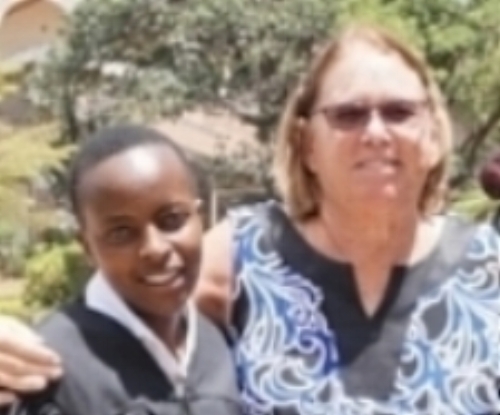 As EFAC’s best advocate, Nancy shared the story and needs of EFAC with Mona and invited her to consider traveling to Kenya to find her opportunity to give back. As Mona was already in search of an opportunity like this, this sounded like the perfect commitment. Mona hopes that three months in Kenya will allow her to understand if this type of global volunteerism is something that she can do to make an impact and hopes that this will be the next phase in life for her. Mona will be living and working at Vanessa Grant Girls School in Rongai, Kenya. She is really looking forward to working with high school age girls. She has heard about how excited these students are to have the opportunity for education and she is excited to see this in person. Additionally, Mona loves spending time with young people and watching how their minds work. She will be tutoring students in all subjects and will specifically be helping students with computer skills and English classes. She may also spend some time working with students at the Rongai Boys School as well. Mona is an avid yoga enthusiast and sent 25 yoga mats to Kenya in advance of her trip. She hopes to find time to share yoga with those students who are interested at VGGS. Mona hopes to provide them with a peacefulness that she has always found in yoga. EFAC is excited to provide our students with this opportunity. Mona’s goal for this trip is to immerse herself in the cultural experience of another place, another country in hopes of gaining a larger world view to share with her son, her family and others. EFAC is so excited to have Mona join us in Kenya and we look forward to posting updates from her upcoming travels both here on the blog and on social media! One of the important values of EFAC is the mentoring that sponsors provide to the students. The financial support is a necessary prerequisite, but the wisdom of life experience is a precious resource for guiding their education investments toward a rewarding future. We sponsors need to also act as mentors and help teach the stuff that they don’t teach you in school. Communicating more effectively tops the list of almost everyone’s self-improvement aspirations, yet it usually gets little emphasis in mainstream curricula. This is also the #1 goal of most business organization’s strategic plans, most family counselor’s advice to partners, and most supervisor recommendations to employees who want to grow their careers. Why are students, employees, supervisors, parents, spouses and teachers so laissez-faire in teaching effective communications? One hypothesis is that communicating more effectively is personal and introspective. It requires people to get outside their heads to evaluate what they need to do to improve. It also takes objective critique, and forces us to make judgments about personal style. Such objective self-reflection is rare, limited to the few truly egoless people who can do it well. Finally, the most effective communications are honest, and we all know how hard it is to be honest with ourselves and with others, especially when discussing sensitive topics. I was lucky enough to attend excellent public schools and several elite institutions of higher learning (the U.S. Air Force Academy, Cal Berkeley, the University of Michigan, and UCLA). I have worked at companies that are considered standouts at investing in employee education, including TRW, Rational Software Corporation, and IBM. Surprisingly, as I reflect back on my privileged path of education, I can’t recall any courses spending much time on the topic of improving communication. Furthermore, most of my primary sponsors and authority figures didn’t encourage me to care. We could blame our schools and parents for ineffective teaching, but we students were equally at fault: We were so smart in our teens and twenties that we didn’t listen well to our instructors or parents. My father, who earned a PhD in astronautics from the California Institute of Technology, was an expert in the benchmark of hairy stuff, better known as rocket science. Although he was a gifted writer and communicator, he never emphasized to me the importance that those skills played in every facet of life. Or maybe he did, and I wasn’t listening. My mother, a voracious reader, writer, and lover of crossword puzzles, did emphasize the importance of communicating well in her words and her actions, but my brain was not wired to listen to her as I went through my formative years. That was my loss, because she was right. I was naturally gifted in math ability, so science and math became my self-proclaimed identity. Most of my school clique had no use for the more social skills of English. Our future was certainly some sort of engineering or scientific pursuit. English, literature, writing, speaking, and teamwork exercises were for the social-studiers, not for engineering studs like us. How naïve we were. There are few growth paths in this world that don’t require strong communications skills. Just look at any profession and you will see that most of the standouts have learned how to communicate more effectively than their peers. As mentors to EFAC students, our one-on-one communications are a powerful channel to make an impact. Emphasizing the importance of communicating effectively is a gift we can all bring to our students and to their teachers. We can do it in our words, and we can also do it by practicing what we preach in our direct communications with them. We must also make this lesson fun and relevant or it probably won’t be attractive to our youthful students. That next email or letter you send off can make a big difference. © 2018 Education For All Children. Education For All Children is a 501(c)3 and all gifts are tax deductible. CFC#15308.